Rubber Nanocomposites: Preparation, Properties and Applications focuses on the preparation, characterization and properties of natural and synthetic rubber nanocomposites. The book carefully debates the preparation of unmodified and modified nanofillers, various manufacturing techniques of rubber nanocomposites, structure, morphology and properties of nanocomposites. The text reviews the processing; characterization and properties of 0-, 1D and 2D nanofiller reinforced rubber nanocomposites. It examines the polymer/filler interaction, i.e., the compatibility between matrix and filler using unmodified and modified nanofillers. The book also examines the applications of rubber nanocomposites in various engineering fields, which include tyre engineering. 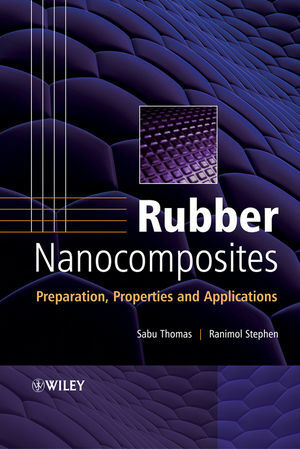 The book also examines the current state of the art, challenges and applications in the field of rubber nanocomposites. The handpicked selection of topics and expert contributions make this survey of rubber nanocomposites an outstanding resource for anyone involved in the field of polymer materials design. A handy "one stop" reference resource for important research accomplishments in the area of rubber nanocomposites. Covers the various aspects of preparation, characterization, morphology, properties and applications of rubber nanocomposites. Dr. Ranimol Stephen received his PhD in 2005 from Mahatma Gandhi University and has been working at the university as a Senior Research Fellow of School of Chemical Sciences. 1 Nanocomposites: State of the Art, New Challenges and Opportunities (Ranimol Stephen and Sabu Thomas). 1.4 Future Outlook, Challenges and Opportunities. 2 Manufacturing Techniques of Rubber Nanocomposites (Jun Ma, Li-Qun Zhang and Li Geng). Filler Particles (Liliane Bokobza and Amadou Lamine Diop). 3.3 Properties of the Hybrid Materials. 4 Interface Modification and Characterization (Jun Ma, Li-Qun Zhang and Jiabin Dai). 4.2 Rubber Nanocomposites Without Interface Modification. 4.3 Interface Modification by Nonreactive Routes. 4.4 Interface Modification by Reactive Routes. 4.5 Characterization of Interface Modification. 5.2 Preparation of Polysaccharide Nanocrystals. 5.3 Processing of Polysaccharide Nanocrystal-Reinforced Rubber Nanocomposites. 6 Carbon Nanotube Reinforced Rubber Composites (R. Verdejo, M.A. Lopez-Manchado, L. Valentini and J.M. Kenny). 7 Rubber/Clay Nanocomposites: Preparation, Properties and Applications (K.G. Gatos and J. Karger-Kocsis). 7.2 Clays and Their Organophilic Modification. 7.3 Preparation of Rubber/Clay Nanocomposites. 7.4 Properties of Rubber/Clay Nanocomposites. 8 Cellulosic Fibril–Rubber Nanocomposites (Maya Jacob John and Sabu Thomas). 8.4 Studies on Cellulosic/Latex Nanocomposites. 9 Nanofillers In Rubber–Rubber Blends (Rosamma Alex). 9.3 Role of Nanofillers in Reinforcement. 9.4 Methods to Enhance Polymer–Filler Interaction and Reinforcement. 9.5 Role of Nanofiller as Compatibilizer. 9.6 Structure Compatibility Concept of NR-Based Latex Blends. 9.7 Solubility Parameter and Mixing of Latices. NR Latex: Preparation, Characterization and Mechanical Properties. 10 Thermoplastic Polyurethane Nanocomposites (S.K. Smart, G.A. Edwards and D.J. Martin). 10.3 TPU Chemistry, Morphology and Properties. 11 Microscope Evaluation of the Morphology of Rubber Nanocomposites (Hiroaki Miyagawa). 12 Mechanical Properties of Rubber Nanocomposites: How, Why . . . and Then? (L. Chazeau, C. Gauthier and J.M. Chenal). 12.2 Typical Mechanical Behavior of Rubber Nanocomposites. 12.3 How to Explain Reinforcement in Rubber Nanocomposite? 13 Nonlinear Viscoelastic Behavior of Rubbery Bionanocomposites (Alireza S. Sarvestani and Esmaiel Jabbari). 13.3 Nonlinear Viscoelasticity of Hydrogel Nanocomposites. 14 Rheological Behavior of Rubber Nanocomposites (Philippe Cassagnau and Claire Barres). 14.4 Flow Properties of Rubber Nanocomposites. 15 Electron Spin Resonance in Studying Nanocomposite Rubber Materials (S. Valic). 15.1 An Approach to the Study of Polymer Systems. 15.2 ESR – Spin Probe Study of Nanocomposite Rubber Materials. for Improving Filler–Elastomer Interactions in Nanocomposites (Soo-Jin Park and Byung-Joo Kim). 16.2 Surface Modification of Silicas. 16.3 Solid-State NMR Analyses of Silicas. 16.4 Surface Energetics of Silicas. 16.5 Other Surface Analyses of Modified Silicas. 16.6 Mechanical Interfacial Properties of the Compounds. 17 Wide-Angle X-ray Diffraction and Small-Angle X-ray Scattering Studies of Rubber Nanocomposites (Valerio Causin). 17.6 Characterization of the Matrix in Polymer-Based Nanocomposites. 18 Barrier Properties of Rubber Nanocomposites (Changwoon Nah and M. Abdul Kader). 19 Rubber/Graphite Nanocomposites (Guohua Chen and Weifeng Zhao). 19.2 Graphite and its Nanostructure. 20 Aging and Degradation Behavior of Rubber Nanocomposites (Suneel Kumar Srivastava and Himadri Acharya). 20.2 Types of Fillers Used in Rubber Nanocomposites. 20.3 Aging of Rubber Nanocomposites. 20.4 Degradation of Rubber Nanocomposites. 21 Positron Annihilation Lifetime Spectroscopy (PALS) and Nanoindentation (NI) (Dariusz M. Bielinski and Ludomir Slusarski). 21.2 Positron Annihilation Lifetime Spectroscopy. Organoclay Nanocomposites (K.M. Sukhyy, E.G. Privalko, V.P. Privalko and M.V. Burmistr). 23 Theoretical Modeling and Simulation of Rubber Nanocomposites (Jan Kalfus and Josef Jancar). 23.2 Brief Theory of Conformation Statistics and Chain Dynamics. 23.3 Basic Aspects of Rubber Elasticity. 23.4 Mechanisms of Nanocomposite Reinforcement. 23.5 Chains at Rubber–Filler Interfaces. 23.6 Structural Peculiarities of Rubbery Nanocomposites. 24 Application of Rubber Nanocomposites (Miroslawa El Fray and Lloyd A. Goettler). 24.2 Rubber Nanocomposites in Tire Engineering Applications. 24.4 Applications of Rubber Nanocomposites in Sporting Goods. 24.5 Advanced Nanocomposites for Airspace Applications. 24.6 Nanorubbers in Medicine and Healthcare.